The first two items are self-explanatory and you can read about them and look at their sample reports on the OUR SERVICE menu. The third item is the exciting one for our clients since they can view all 7 major recession models we maintain in a side-by-side fashion during each expansion and recession. This allows detailed inspection of the co-movement of our various short-leading, long-leading and co-incident recession models. 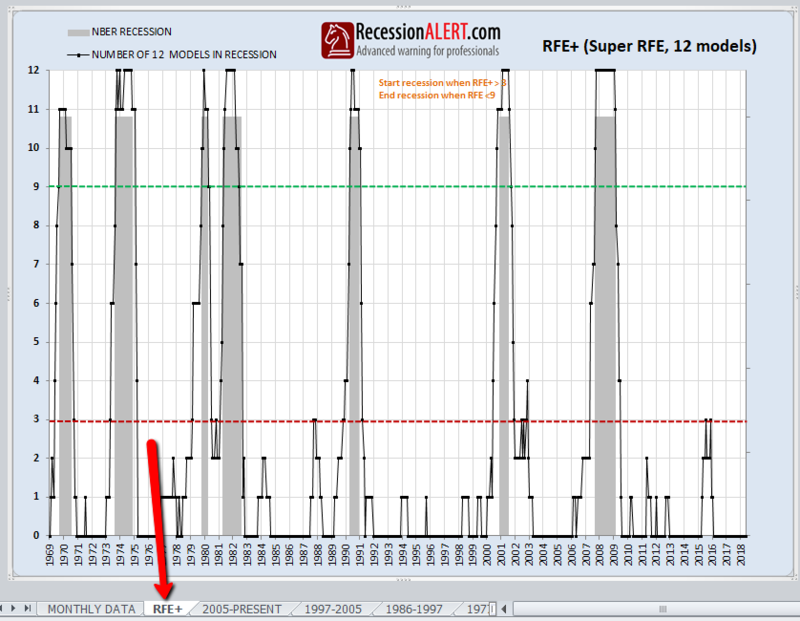 In addition, clients can select their favorite RecessionALERT quantitative models and combine them together into a custom composite and view the behavior of the composite and its components over time. This allows financial advisers and brokerage firms to custom-build robust recession models unique to their practice or brand for input into the overall quantitative process used by them to manage their clients affairs. Clicking on the “1968-1977” tab, we can observe the behavior of both our selected long-leading growth indices together with their averaged composite, around the 1970 and 1974 recessions. 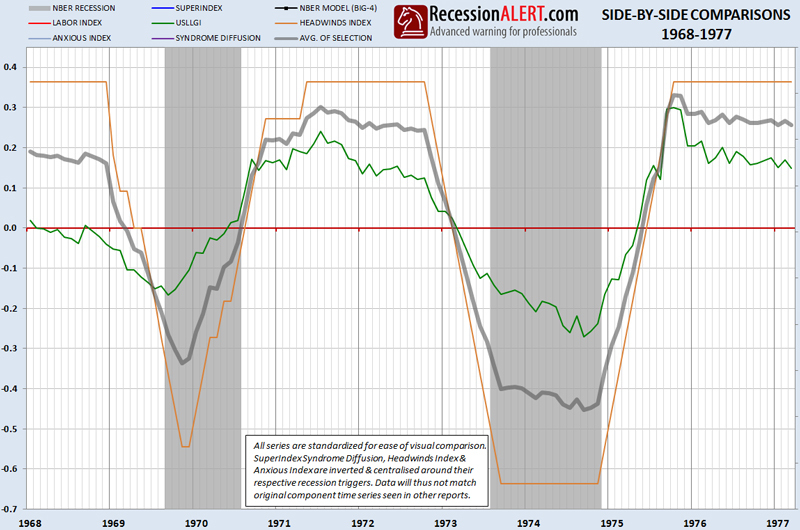 You can see that both the HeadWinds Index and the USLLGI dipped below the zero line, signalling recession within 1 month of each other some 6 months before the onset of the 1974 recession. Here is another example, where we wanted to observe the co-movement of the SuperIndex with the US Long Leading Index in the 1997 to 2005 period. 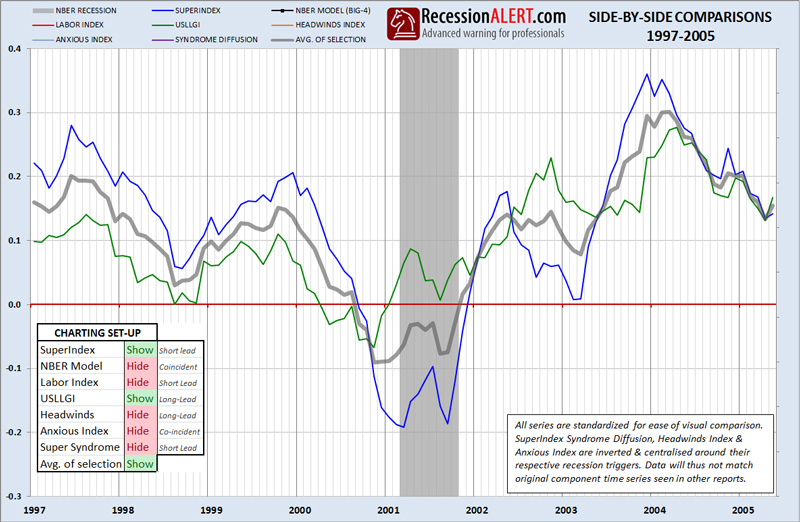 We see that the USLLGI signaled recession some 5 months before the SuperIndex, which in turn signaled recession 5 months in advance.